For the first time, a space meal doesn’t look like it came out of a tube: European Space Agency astronaut Samantha Cristoforetti has posted a video of how she makes taco in space. 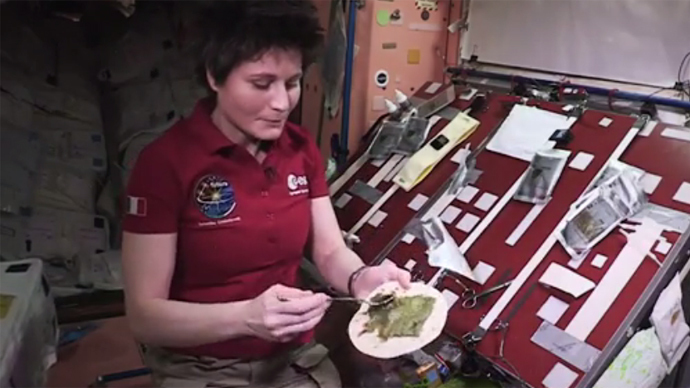 In the footage, Cristoferetti puts leek, cream, tomatoes, quinoa and mackerel on her tacos, preparing maybe the first-ever gourmet meal in gravity-free orbit: freeze-dried beef patties and orange cheese sauce are more like the fare that most ISS crews can look forward to. It’s far from easy to prepare the space taco: ingredients try to flee from the astronaut, but she manages to put them together into what seems to be a droolingly tasty taco. It’s usually tortillas that astronauts eat at the ISS: crumbs without gravity can be dangerous.